1. Complete your registration process with your $65 Registration Fee using the CPDI Africa website portal@ www.cpdiafrica.org. Alternate Payment Options are provided, inclusive of Paypal, Bank Deposits, Wire Transfers. 2. Login to www.cpdiafrica.org with your Username, Password to Download the CPDI Africa 2017 Design Brief. 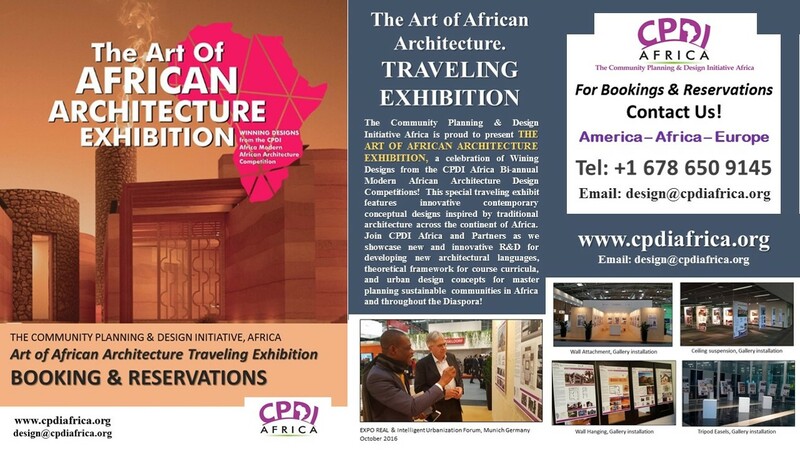 Begin to research and generate a concept of your African architecture Masterpiece. Payment of Fees can be made any time before the August 1st deadline! 3. Complete your Masterpiece and prepare to submit either as in Individual, or as part of a Team. Early submission opens May 31st, 2017. Final submission is Midnight, August 1st, 2017. We Wish You the Best of Luck on your Submission!! APPLY WITH US to do an Internship with CPDI Africa, and earn the opportunity for paid research jobs! CPDI Africa is looking to offer flexible short term jobs to students in architecture, engineering and construction, arts and graphic design, history and African studies, media and marketing, upon their successful, outstanding participation in our internship program. Internships are a free six week, non-paid workshop that can be completed virtually or in our studio! Do reach out to us for more information on this ground breaking project, and as the main contact for your organization, we appreciate your sharing of these great opportunities with your members! Best of luck and we look forward to your special participation with CPDI Africa!